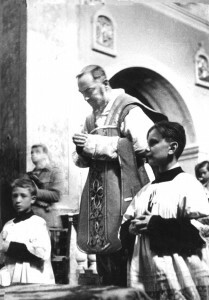 Twelve-year-old Pio Abresch (right) assists Padre Pio at Mass. Padre Pio predicted that young Pio would one day become a priest. Padre Pio, in his lifetime, reconciled innumerable souls back to God through the sacrament of confession. He was always in great demand as a confessor. People were willing to wait many days and brave any inconvenience in order to make their confession to him. In the early days, before there were accommodations for the pilgrims, the men who waited to make their confession to Padre Pio would sometimes sleep at night in the fields near the monastery. Some would even pitch tents in the open areas. When the sun rose, they would resume their place in the confessional line. Padre Pio had a true understanding of human weakness and was willing to go to great lengths to help a person. However, if a person was not sorry for his sins, Padre Pio did not feel that he could do much for that individual. He recommended to some individuals that they go to one of the other Capuchins to make their confession, rather than to him, without explaining the reason why. When he sent people out of the confessional because they were not adequately prepared to make their confession, it weighed on him. “If you could only understand how I suffer when I have to refuse absolution,” Padre Pio said. “But it is better to be criticized by a man in this life than by God in the next life.” He never advocated that other priests adopt his unconventional methods. “What I do, you cannot do,” he once said to a fellow priest. During World War II, an American soldier had the opportunity to make a visit to San Giovanni Rotondo. At the monastery, he was not able to make his confession to Padre Pio because he did not speak Italian. Instead, he was directed to the confessional of a priest who was hearing confessions in English. As the soldier passed through the sacristy, he saw Padre Pio for the first time. Padre Pio stared at the young American with deep concentration. During those moments, the soldier became aware that his mind was being healed. He could feel a definite change in his thought patterns, a complete shift in his usual way of thinking. Many people testified that their encounter with Padre Pio in the confessional brought them back to a state of inward peace. To a woman who felt intense sorrow because of the death of her child, Padre Pio said, “I want you to know that your child has gone to a place where there is no more pain, no more suffering. That should be a great consolation to you.” And indeed, his words were truly a great consolation to the woman. Padre Pio was always at our disposal. Even when we could not get near him because of the crowds, it was enough for us to turn our thoughts to him. We felt him standing by us, not only protectively but so many times also tangibly, through the prodigious perfume of sanctity which we were conscious of. He always stood by us both materially and spiritually. He accepted all our requests, met all our anxieties, listened to all our sins. He took upon himself all our miseries as if they were his own, to such an extent that he sometimes lamented, “I can’t go on any more.” This humble confession of the heaviness of his cross, moves and comforts us at the same time. His was an endless love. German-born Friedrich Abresch lived in Bologna, Italy where he worked as a professional photographer. He converted to Catholicism in order to please his fiancé, Amalia, who was a Catholic. Friedrich was a Catholic in name only. He did not have faith in the teachings of the Church. He rarely went to Mass and as time passed he began to feel a great antipathy for anything that had to do with Catholicism. Later, he took up the study of spiritualism, occultism, and magic. When Friedrich learned about Padre Pio, his curiosity was aroused. He was fascinated by the stories of the miracles and healings associated with Padre Pio and wanted to make a trip to San Giovanni Rotondo in order to meet him. In Friedrich’s mind, the only negative factor was that Padre Pio was a Catholic. Could these obvious manifestations of God’s power really be coming from a Catholic priest? Friedrich wondered how it could be possible. Friedrich was finally able to make the trip to see Padre Pio in 1925. He was twenty-eight years old. When he arrived at the monastery of Our Lady of Grace, Padre Pio greeted him, but was by no means cordial. He only made a few rather cold remarks. Friedrich had traveled a long distance from Bologna to the little town of San Giovanni Rotondo and was somehow expecting a friendlier reception. Later, when Friedrich made his confession to Padre Pio, Padre Pio told him that in his previous confessions, he had withheld serious sins from his confessor. His words, which were true, shocked Friedrich. He wondered how Padre Pio could have known. Padre Pio then asked Friedrich if his previous confessions had been made in good faith. He answered that they had not. Friedrich told Padre Pio that he did not believe in the sacrament of confession. Although he felt that it was a useful psychological and social tool, he did not believe that it could impart grace. However, Friedrich had been deeply moved by his few moments with Padre Pio and by the fact that Padre Pio could see into the secret depth of his soul. “I did not believe in the sacrament of confession before,” Friedrich said to Padre Pio. “But now suddenly, by talking with you, I believe in it,” he added. As though in great pain, Padre Pio told Friedrich that his beliefs were all heresies. He added that all of his past communions had been sacrilegious. “Make a good examination of conscience,” Padre Pio said. “Try to remember when you last made a sincere confession. You must make a general confession.” He told Friedrich that he would hear his confession later in the day. “Jesus has been more merciful to you than he was to Judas!” Padre Pio said. He then left Friedrich in the sacristy and went to hear the women’s confessions. Friedrich felt shaken to his roots by his contact with Padre Pio. He also felt dazed and confused. He tried to gather his thoughts together but he could not seem to concentrate. He made a supreme effort to recall the last time he made a sincere confession. Try as he might, he could not remember. He tried to focus his mind and make an examination of conscience so that he would be prepared to make a general confession. Friedrich decided that he would tell Padre Pio that he had been a Lutheran before converting to Catholicism. He would explain that he had been conditionally baptized into the Catholic Church. At that time, all of his sins were forgiven. He would begin his confession by talking about his childhood. When Friedrich knelt before Padre Pio once again in the confessional, before he could finish his first sentence, Padre Pio interrupted him. “When did you make your last good confession?” Padre Pio asked. Friedrich was not sure if he had ever made a good confession. He told Padre Pio that he could not remember. Padre Pio then reminded him of the time, adding some of the particulars of that confession. It took place shortly after Friedrich was married. That confession had long slipped from his memory but he realized that Padre Pio was right. “Begin your confession from the time I have just mentioned,” Padre Pio said. Friedrich was astonished that Padre Pio had such detailed knowledge of the events of his past life. He realized that he had come in contact with the supernatural. Padre Pio then enumerated all of Friedrich’s mortal sins by asking him questions about those very sins. He was even able to state the number of times he had neglected to go to Mass. Everything was laid bare before Friedrich’s eyes. He made Friedrich understand the gravity of the state of his soul. “You have launched a hymn to Satan, whereas Jesus, in his tremendous love, has broken himself for you,” Padre Pio said. He then gave Friedrich a penance. When Padre Pio pronounced the words of absolution, Friedrich found it hard to breathe. He felt like he was suffocating. But after he left the confessional, his joy was so great that he could hardly contain himself. From that day forward, Friedrich attended Mass every day. Friedrich later prepared a written testimony stating that he believed, not only in all of the dogmas and precepts of the Catholic Church, but also in all of the Church’s traditions and ceremonies, even down to the smallest detail. He stated that his faith was so strong that no one would ever be able to shake it. He would prefer to lose his life rather than his faith. Friedrich had a great desire to be near Padre Pio. He and Amalia decided to move from their home in Bologna to San Giovanni Rotondo. There, they became active members of the Third Order of St. Francis. They were very happy living close to Padre Pio and participating in the spiritual life of the church of Our Lady of Grace. One day, while in the church of Our Lady of Grace, Friedrich took some photographs of Padre Pio during the celebration of the Mass. He had not asked permission to do so. Much to Friedrich’s surprise, the photos all turned out blank. The next time he wanted to take a photograph of Padre Pio, he asked for his permission. Padre Pio was strongly opposed to the idea and would not agree to it. But Friedrich was persistent. He asked the Capuchin superior for permission and he gave his consent. Padre Pio submitted out of obedience to his superior but he still resisted the idea. When Padre Pio was told that the photos were a consolation to many people, he finally became more accepting. Friedrich became Padre Pio’s official photographer and left a number of exceptional photographs of him to posterity. In honor of their spiritual father, when Amalia and Friedrich welcomed their newborn son into the world, they named him Pio. Both Friedrich and his son Pio, served Padre Pio’s Mass on many occasions. Padre Pio predicted that Pio Abresch would one day become a priest and would have a high position in the Church. His prophecy came true. Pio Abresch was ordained to the priesthood in 1956. Monsignor Pio Abresch was sent to Rome and was assigned to work at the Congregation for Bishops at the Vatican. 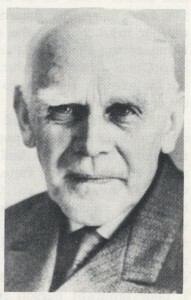 Friedrich Abresch died in August 1969, almost one year after the death of Padre Pio. Biagio Fusco saw Padre Pio for the first time in 1919. Some of his relatives had urged him to make the trip to San Giovanni Rotondo and he also felt motivated by a certain sense of curiosity regarding Padre Pio. He happened to arrive at the monastery just as Padre Pio had begun to say Mass. During the Mass, Biagio began to think about how far he had drifted from his faith. His moral and spiritual life had been on the downhill slide for a long time. He was so moved by Padre Pio’s Mass that he felt suddenly inspired to change his life and to return to the sacraments. Biagio was also able to make his confession to Padre Pio. The church and the confessional were very crowded that day. The Italian state police (the Carabenieri) were present to maintain order in the church. After Biagio returned to his home, he continued to think about Padre Pio. Before his visit to Padre Pio, nothing could motivate him to change his life. He was attached to his sins and did not have the will or the desire to change. But the short visit to Padre Pio produced a radical transformation in his life. Sometimes Biagio noticed the unexplainable scent of violets, roses, and incense in the air. He felt it was a sign that Padre Pio was trying to encourage him to sustain his faith in its first steps. Several years later, Biagio returned to the monastery of Our Lady of Grace and was able once again to make his confession to Padre Pio. When Biagio confessed a particular sin, Padre Pio interrupted him and said, “You confessed that sin two years ago. You are a backslider.” Biagio knew that Padre Pio heard confessions day in and day out, for many hours a day. He was astonished that Padre Pio was able to remember what he had confessed to him in the past. The next time Biagio visited San Giovanni Rotondo, he had a very important matter to discuss with Padre Pio. In the confessional, he explained to Padre Pio that he would soon be taking an examination for a teaching position. He had been trying for four years to obtain a job as a teacher, to no avail. Biagio asked Padre Pio to pray that he would pass the test and also to pray that he would secure a job. Biagio had a wife and six children to support and he constantly worried about his precarious financial situation. As Biagio was telling Padre Pio about the upcoming test, Padre Pio raised his eyes upward. His face became serene and beautiful. As Biagio gazed at him, he was convinced that all would be well. Shortly after that, Biagio received a letter in the mail which offered him a teaching position in a nearby town. The letter was dated July 27, 1923, the same date that he had made his confession to Padre Pio and had requested his prayers. With great joy and thanksgiving in his heart, Biagio accepted the teaching position. Biagio went to the school board in order to negotiate for the school that he wanted to work at. The board member who met with him told him how fortunate he was. “Jobs these days are extremely scarce,” he said. “You are indeed very lucky to have been hired. It is almost like a miracle!” At his words, the air became filled with a strong perfume. Biagio knew at that moment that Padre Pio was present and was interceding for him. Biagio was assigned to work at the school of his choice and after a short time the job became permanent. Eighteen-year-old Andre Mandato attended Mass every Sunday without fail. Even so, he only went to confession once in a great while. To Andre, it did not seem necessary. He never had any serious sins to confess or any pressing problems that he needed to discuss with a priest. But more important, he lacked faith in the value of confession. He knew very well that the Church taught that the sacrament of reconciliation imparted sanctifying grace to the penitent. However, in his heart, Andre was not convinced that it was true. Andre’s attitude underwent a complete change when he made his confession to Padre Pio for the first time. Padre Pio’s words shocked Andre. He had always believed that asking God for forgiveness was enough. But as he reflected on it, he was able to grasp what Padre Pio was trying to convey to him. If a person asked forgiveness of God for a sin that was committed, that person should make a supreme effort never to commit the sin again. Unfortunately, that was not always the case. In Andre’s life, it was not the case. Andre was suddenly able to understand the true malice of sin, and the seriousness of offending God. When Andre left the confessional, he felt crushed. He began to cry and was unable to stop. The confession to Padre Pio marked a true turning point in his life and brought about a great spiritual change within him. In the end, everything worked out perfectly and Remo was very happy that his son was able to make his confession to Padre Pio. Before Remo and his son left the monastery to return to their home in Terni, Italy, they went to say goodbye to Padre Pio. When Padre Pio caught sight of Remo, his face brightened. Before Remo had a chance to utter a single word, Padre Pio said to him, “I would have done it out of love for you.” Words to treasure! He had prayed that Padre Pio hear his son’s confession out of his love for the Virgin Mary. But Padre Pio assured Remo that his love for him was very great, and because of that love, he had answered Remo’s heartfelt prayer. Monsignor John Gannon had a great devotion to Padre Pio and visited him in San Giovanni Rotondo on a number of occasions. Padre Pio always referred to him as the “American Monsignor.” Monsignor Gannon spoke to Padre Pio’s assistant, Father Eusebio Notte and said, “There must be many American priests whom Padre Pio refers to as the “American Monsignor.” “No, you are the only one he refers to in that way,” Father Eusebio replied. Once, Monsignor Gannon was speaking with some friends at the monastery of Our Lady of Grace. Suddenly, a man approached the group with a ticket for Padre Pio’s confessional in his hand. “I am not going to be able to use this ticket,” the man said. “Would any of you like to have it?” “You should give it to Monsignor Gannon,” a man in the group replied. Monsignor Gannon now had a ticket for Padre Pio’s confessional, but he had a problem. He could not speak Italian and Padre Pio did not hear confessions in English. One of Monsignor’s friends who spoke Italian offered to help him. He told him to write out his confession and he would translate it into the Italian dialect that Padre Pio spoke. Monsignor Gannon was very grateful for the help. Monsignor Gannon practiced making his confession in Italian until he felt confident that Padre Pio would be able to understand him. In the confessional, Monsignor began to read from the paper that his friend had transcribed for him. When he got half way through his confession, Padre Pio suddenly interrupted him. He repeated what was on the rest of the paper, word for word. Monsignor Gannon knew that it was impossible for Padre Pio to see what was written on the paper that he had in his hand. He could hardly believe what had happened. When disturbed by passions and misfortunes, may the sweet hope of His inexhaustible mercy sustain us. Let us hasten confidently to the tribunal of penance where He awaits us at every instant with the anxiety of a father, and even though we are aware of our inability to repay Him, let us have no doubts about the solemn pardon pronounced over our errors. Let us place a tombstone over them, just as the Lord has done.